Genre: Third-person shoot 'em up. The video game interpretation of the Bond film Tomorrow Never Dies was in some ways the victim of circumstance. 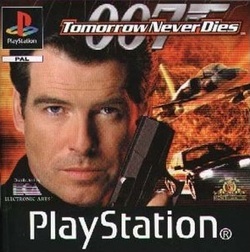 What would otherwise have been a standard film tie-in was instead paid significant attention due to the immense critical success garnered by GoldenEye 007 on the N64. Developer Black Ops thus had to deal with an unrealistic weight of expectation given the comparatively-modest hardware, though it doesn’t excuse the fact that, even without the spectre of Rare’s colossus looming over it, TND is a sub-standard PlayStation shooter. Chiefly a third-person shoot ‘em up, there’s also a light sprinkling of stealth, skiing, driving, and gadget usage thrown in as well. Whilst the game certainly doesn’t lack for endeavour, the execution is a bit of a mess. A few minutes of the first level will show you what you’re up against; a choppy frame-rate that goes into meltdown whenever there are more than three enemies on screen at once, slow and lethargic controls and a general lack of polish to the visuals that give the game a rather cheap veneer. A.I. is highly questionable, sometimes utterly oblivious to your presence whilst occasionally going a bit mad and either circling at high-speed or zigzagging towards your position in an unusual kamikaze routine. It’s probably just as well though given that much of your time will be occupied with getting Bond to face them. The manual crosshair is a proficient tool at distance though not especially practical up close. For this, a tap of Circle will have your character facing the target in a semi auto-aim idea. If they dodge though, you keep having to press it to readjust, and it is prone to letting you down in pressure situations, going haywire and facing the hapless spy in completely the wrong direction. The shooting is competent if clunky, with a solid array of firearms (though the lack of a reload button is remiss) and the occasional level, such as Saigon (which sees you playing as Bond’s accomplice Wai Lin), coming close to forging an acceptable blend of stealth and action. For the most part though, levels resort to type with the usual shoot enemy/find key train of thought. Other promising settings, such as the Hotel Atlantic, are stifled by excessive enemy replication, whilst boss fights are a big let-down too, generally featuring a henchman chucking grenades/blades at you and running around gormlessly. The skiing sections are dismal. The main challenge comes from fending off terrorists waiting at pre-determined points on the slope, the problem being that both parties 'defend' themselves by poking at each other with ski poles in the most piteous fashion you could imagine, occasionally trees will deal some damage but on the whole it’s a case of not getting wedged between foes. Driving Bond’s BMW meanwhile is more fun, shining a rare bright spot on the gameplay as it handles well and the general physics and graphics seem to cope better than elsewhere in the game, although disappointingly, there’s only one short section to enjoy. Whilst the developer has certainly delivered on a range of settings, there’s no getting around that fact that TND is an ugly game. Whilst Bond’s movement is quite convincing, he is rather gorilla-esque in his appearance thanks to a massive, chunky torso and small head. The jet-setting array of levels look passable but the draw-distance is really poor on the outdoor levels, whilst the skiing bits are prone to liberal amounts of pop-up. TND has but two real areas of success. Its presentation is slick and attractive, whilst the occasional FMV action sequence lifted from the film, as well as a credits sequence re-designed especially for the game, look fantastic. The soundtrack is also first-rate, granting a rich atmosphere to a rather rickety game, though the audio side loses marks thanks to some disinterested voice-acting and cut-scenes that are scripted so badly they’re funny. The ten missions are relatively brief, and are for the most part, bar the odd spike in the difficulty, fairly easy to polish off. The absence of multiplayer is also damaging to the game’s long term credentials, and it’s likely more will have had their fill after a few levels. TND is a disappointment all-told, and a surprisingly tardy effort considering it was published under the EA umbrella. 1999 witnessed Solid Snake’s stealth heroics and Gabe Logan’s similar though superior gunnery, meaning that Bond’s rather belated first landing on the PlayStation makes him seem like, as M might have put it, a relic of the Cold War. "Solid Snake’s stealth heroics and Gabe Logan’s similar though superior gunnery meant that Bond’s belated first landing on the PlayStation seemed like, as M might have put it, a relic of the Cold War"